It bridges the gap between work and personal life, making employees feel more connected. We all have that colleague who has a couple dozen tabs open in their web browser at any given time, letting them pile up and shrink smaller until it’s difficult to distinguish among them. One of the developers at collaboration software company Bluebeam is especially notorious for hoarding web pages, so one time while he was on vacation, his co-workers printed out hundreds of images of tabs and wallpapered his cubicle with them. The fun didn’t stop there. Bluebeam’s creative director, Jon Setzen, is mildly creeped out by birds. 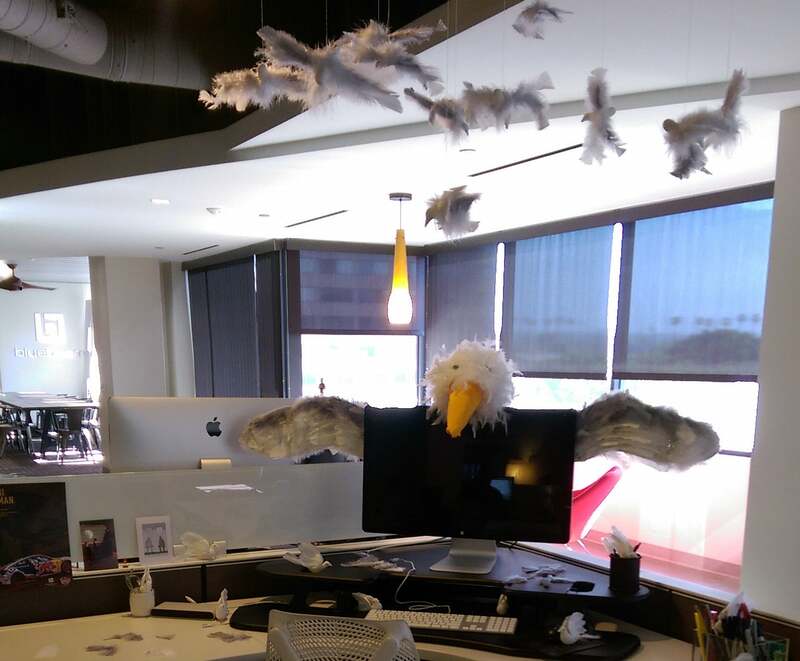 He returned from a recent span of time off to a desk covered in handmade, 3-D birds hanging from the ceiling and perched next to his computer. 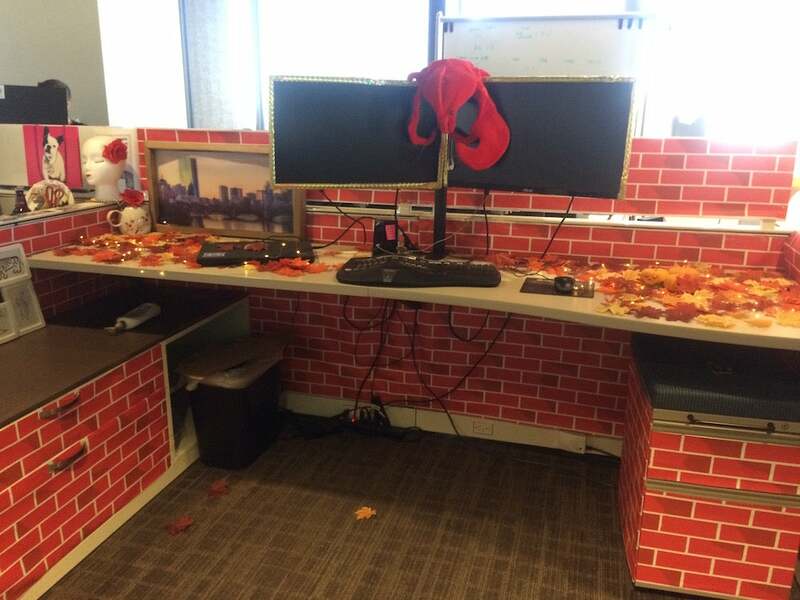 The team at Bluebeam doesn’t decorate every time a colleague is on vacation, but about once a month, someone comes back to a surprise. Heverly says the company’s tradition of desk-decorating during employees’ vacations preceded her start at the company in 2009. Back then, there were only 23 people working out of Bluebeam’s Pasadena, Calif., headquarters -- now there are more than 200 in that office alone. One of the first decorations Heverly recalls was during the swine flu epidemic, one employee took a trip to Mexico -- the country where the virus originated. She arrived back to work at Bluebeam to find her desk transformed into a quarantine zone, with PVC and plastic wrap set up to wall her in. In her role, Heverly oversees aspects such as making sure lighting is optimized for productive work, adding plants to beautify the space and helping to adjust workstations to be ergonomic. But when it comes to the desk decorating tradition, she’s hands-off. There’s no formal sign-up sheet or brainstorming process. If someone has an idea of how to decorate another person’s desk, it’s up to them to figure out how to execute it. Employees can even use office resources, such as packing peanuts and tape, though people often spring for their own supplies. Ninety percent of the time, Heverly estimates, installations are themed based on where the person went on vacation. For example, engineer Julia Wagner returned from Boston to find her desk covered in a brick pattern and a stuffed lobster sitting on her monitor. (The lobster is one of many artifacts of the desk decorating that remains visible today.) The other 10 percent of installation themes are based on personality characteristics co-workers want to tease one another about, such as the excessive browser tab habit. One major benefit, Heverly says of the tradition, is that it promotes creativity. Employees, many of whom spend their days writing lines of code, have the experience of building something with their hands -- even if it is out of construction paper and popsicle sticks. Working on a desk decoration together also enables team bonding and low-stakes problem-solving. It also bridges the gap between work and personal life, making employees feel more connected. Some employees say that coming back to a decorated desk positively contributes to their memories of a trip they took. The desk installations are not the only way in which Bluebeam employees collaborate creatively on projects that aren’t work related. The company also has a Halloween costume contest every year in which employees form their own teams and dress up in a themed manner. For example, in the past one group dressed as various Southern California freeways. The product management team all dressed as cats, and the department head dressed as a cat herder. One, again, is to let things happen organically. No one oversees these traditions or creates rules around them, and they happen naturally. That way, no one feels like it’s a chore, or obligated to participate because it’s their turn. The second is to highlight traditions like these. Showcase it as a company. One way Bluebeam does this is by pointing out decorated desks to prospective hires during tours. Finally, Heverly suggests encouraging participation across offices, if you work with remote teams. For example, other Bluebeam offices do desk decorating and join in the Halloween costume competition, and it’s proof to Heverly that the company’s culture has taken hold. However, expect and even embrace some variation in how traditions are executed in different locations. How to Deal With the Criticism, "You need to be more likeable..."